Steve Hobden, 34, from Plymouth and a BSc (Hons) Construction Management and the Environment graduate from Plymouth University, is using his skills as part of the team building the University’s new health research laboratories at Plymouth Science Park. Steve has always been interested in construction and studied for a GNVQ in construction at South Devon College before starting his undergraduate studies at Plymouth University. He completed his first two years and then took some time out to work on sites. During this time he qualified and worked as a site carpenter for eight years and then came back to Plymouth University to finish his degree. Steve graduated in 2014 with a first class degree and the accolade of achieving the highest grades on his course. Most recently he worked for construction business ISG on the refurbishment of the Guildhall Shopping Centre in Exeter, before recently joining Kier. 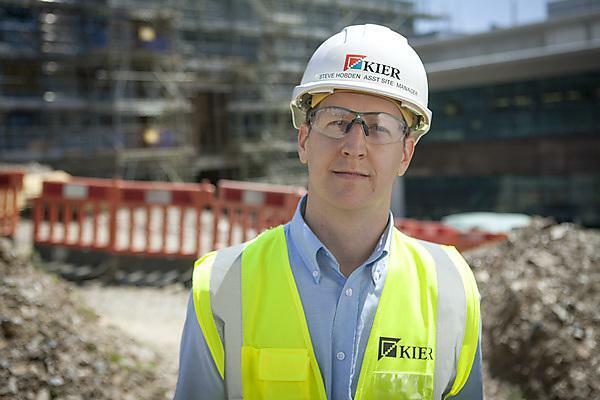 At Kier Steve is Assistant Site Manager at the Derriford Research Facility development, working with the team to deliver new £14.8 million research laboratories, facilities and teaching space. His role sees him supporting the Senior Site Managers and Project Manager. He has a particular role in ensuring health, safety, environment and quality standards are maintained and recorded. He inducts people new to the site, has a daily meeting with supervisors from each of the trades and liaises with the various stakeholders involved with the project.